I often say that Holland Lops are like fried chicken – everyone has their favorite piece. I definitely have my favorite pieces as well. 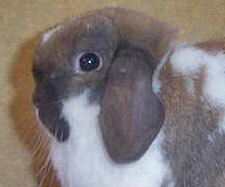 Curvature – I love really good curvature on a rabbit’s face. When I started out, I produced so much snipiness and so many concave faces that it was a thrill to produce some of my first examples of good curvature. I think GC The Nature Trail’s Mercedes has nice curvature. Short, round, thick ears – love ’em. I’ll even tolerate a bit of side-to-side narrowness to get those ears. If I have to choose between a wide crown with long, heavy ears or a set of cute, cute ears with a slightly tight crown, those cute ears will win out every time. I like the ears on GC The Nature Trail’s LaForge. Short, fat bone – stumpy legs just set my heart a thumpin’! And if there is a deep, deep chest on top to get the head up where it’s supposed to be, I’m just about in heaven. 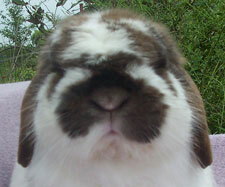 I’d love all of my rabbits to have bone like GC Camelot’s Merlin. Luckily, he’s throwing it well. Cheeks – fat cheeks on a Holland will just make you fall in love. GC The Nature Trail’s Rio has tremendous width between the eyes and big fat cheeks. Beautiful top line – when a rabbit has a beautiful top line and just poses naturally, there’s a sort of, “I know I’ve got it” attitude, understated but substantial. These rabbits don’t have to be posed by their owners. They don’t have to be adjusted. They just plop their rears down and show off their natural beauty. Good depth over the hindquarter, a beautiful turn with no sloping off, is a must. Of course there are other parts I appreciate as well. I like a chunky crown, well placed. I love fur in prime and a smooth hindquarter. I love hind feet that are perfectly parallel and wide apart with matching front feet, wide apart, too. Shoulders are probably my biggest weakness. So it’s a joy to have to stretch my hand to wrap about wide, wide shoulders. I’m a sucker for a massive chest. 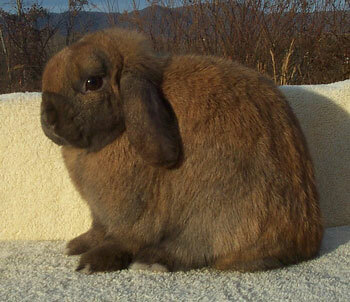 Now the trick, of course, is getting all of these nice parts into one Holland lop! But the first step is knowing what you are aiming for.